To knock out the belly fat, you need the right combination of fitness and nutrition. And with the CORE DE FORCE and Shakeology Challenge Pack, you’ll get the mixed martial arts-inspired workout designed to slash inches off your waist, blast away the belly fat, and carve total-body definition along with Shakeology, the ultra-premium nutritional shake that can help you stay healthy and reach your fitness goals even faster. Created by Trainers Joel and Jericho, it’s 30 days of zero-equipment, core-defining workouts inspired by the most high-octane sport in the world—Mixed Martial Arts! CORE DE FORCE is more than a few Kickboxing moves. It’s a complete, total-body shred —no equipment needed. In 3-minute “rounds,” you’ll alternate between Boxing, Kickboxing, and Muay Thai punches and kicks, cardio spikes, and bodyweight training—a combination that works your core from 360-degrees and helps blast through calories to tighten your midsection and shred belly fat fast. And all you have to do is hit each workout hard while fueling your body with Shakeology, Your Daily Dose of Dense Nutrition®. With the CORE DE FORCE and Shakeology Challenge Pack, you’ll finally have the tools—the MMA-inspired workouts and the superfood nutrition—to get the knockout body you’ve always wanted. Anyone can do these zero-equipment, total-body workouts. Just follow the modifier until you’re ready to kick things up a notch. Plus, each workout includes a step-by-step breakdown to help you master the moves. With this Eating Plan, figuring out what to eat to get your knockout body is never a battle. Inside you’ll find everything you need to get results including signature recipes, sample menus, and a revolutionary approach to eating MORE to fire up your fat-burning metabolism! There are no shortcuts to success. But the tools and tips in this 3-step guide come close. Follow them and you’ll be well on your way to giving body fat the one-two punch. These color-coded portion-control containers are designed to work with your CORE DE FORCE Eating Plan to make meal prep even simpler. Streaming access to your CORE DE FORCE workouts, so you can instantly jump-start your fitness program and tap into hundreds of other digital workouts from our massive collection of world-class programs via any desktop, laptop, TV, tablet, or mobile device. 10% discount on all future purchases on TeamBeachbody.com—including Shakeology! Your own personal Coach for guidance and support. It’s a no-brainer. CORE DE FORCE works. And to prove it to you, go ahead and try it for 30 days. If you don’t get the results you wanted, you can send it back—absolutely zero questions asked. You can even keep the Eating Plan, 5 Min. Core on the Floor and Core Kinetics DVDs as our free gifts to you, just for giving the program a shot. *Shakeology: Starting in 30 days, you’ll receive a fresh supply every 30 days for just $129.95 a month, with a 10% discount if you are a Team Beachbody Club member, billed to the credit card you provide which includes Super Discount shipping (of only $2.00 per item)! Cancel anytime to avoid future charges by calling Customer Service at 1 (800) 470-7870. **After your first 30 days, you’ll be automatically billed to continue your Team Beachbody Premium Club membership, including Beachbody On Demand streaming access, at a cost of $2.99 a week, billed $38.87 per quarter in advance to the credit card you provide today. You can cancel anytime to avoid future charges by calling Customer Service at 1 (800) 470-7870. 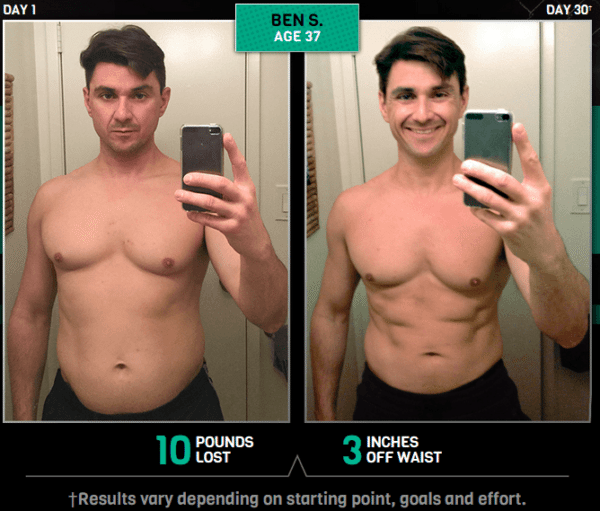 If you choose not to take advantage of your FREE trial membership in the Team Beachbody Club, you may remove it from your Challenge Pack at checkout. This will not, however, change the price you pay today, and you will lose streaming access to CORE DE FORCE and thousands of dollars in additional workouts. Results vary depending on starting point and effort. Exercise and proper diet are necessary to achieve and maintain weight loss and muscle definition. Beachbody, LLC is the owner of the CORE DE FORCE, Shakeology, Your Daily Dose of Dense Nutrition, Beachbody, and Team Beachbody trademarks, and all related designs, trademarks, copyrights, and other intellectual property. © 2016 Beachbody, LLC. All rights reserved. No DVD player? No problem! You can still build a knockout body with the right combination of fitness and nutrition. And with the Digital CORE DE FORCE and Shakeology Challenge Pack, you’ll get both in one convenient package—so you can finally lose the belly fat, tighten up your midsection, and carve total-body definition. 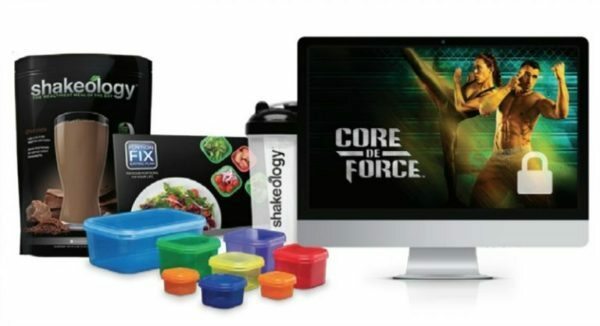 Not only will you get unlimited streaming access to Joel and Jericho’s mixed martial arts-inspired workout, but your Challenge Pack also includes everything you need to create healthier eating habits: Shakeology, the ultra-premium nutrition shake that can help you lose weight and curb cravings, along with Portion Fix, the color-coded container system that makes it easy to master portion control.‡ CORE DE FORCE DVDs not included. With Beachbody On Demand you can stream your CORE DE FORCE workouts online, access all your program materials, and even try some of Beachbody’s most popular programs—like P90X®, INSANITY®, and 21 Day Fix EXTREME®. Plus, you’ll be able to stream new workouts from Joel and Jericho that aren’t available anywhere else. Also on Beachbody On Demand: the CORE DE FORCE “Modifier Track” which lets you view the modifier in “split-screen” mode for every workout if you need help getting started. CORE DE FORCE DVDs not included. With this digital Eating Plan, figuring out what to eat to get your knockout body is never a battle. It includes everything you need to get results including signature recipes, sample menus, and a revolutionary approach to eating MORE to fire up your fat-burning metabolism! 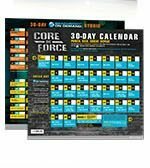 Count down to incredible results with this calendar that includes your daily workout schedule. Eating food in the proper portions is key to your CORE DE FORCE transformation. Portion Fix can make that process even simpler. This portion-control system works with your Eating Plan and includes color-coded containers that correspond to your food lists and the CORE DE FORCE Signature Recipes—making it easier to divvy up your servings and tackle daily meal prep. Seven color-coded containers that make it easy to eat the right portions. A shaker cup to measure your favorite beverages. Simple recipes and guide designed to be the foundation of your healthy lifestyle. Streaming access to your CORE DE FORCE workouts on Beachbody On Demand. Access to our massive collection of world-class programs and content, like the P90X® franchises, 21 Day Fix EXTREME, TurboFire®, and the FIXATE™ cooking show, so you can continue to get incredible results after completing CORE DE FORCE. Meal plans personalized for your goals. 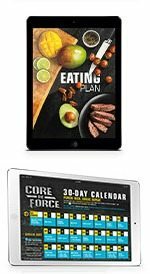 VIP access to Super Trainers and Beachbody experts, including exclusive videos, nutrition tips, and delicious recipes. Message Boards to help you find new friends and workout partners, and get advice and support from the entire community. We’re so sure you’ll love this Challenge Pack, we’re giving you our 90-day money-back guarantee. If you’re not completely satisfied, simply call Customer Service within 90 days for a refund of the purchase price (less any s&h). *Shakeology: Starting in 30 days, you’ll automatically receive a fresh supply every 30 days for just $129.95 a month, with a 10% discount if you are a Team Beachbody Club member, billed to the credit card you provide, which includes Super Discount shipping (of only $2.00 per item) until you cancel. Cancel anytime to avoid future charges by calling Customer Service at 1 (800) 470-7870. **After your first 90 days, you’ll be automatically billed to continue your Team Beachbody Premium Club membership, including Beachbody On Demand streaming access, at a cost of $2.99 a week, billed $38.87 per quarter in advance to the credit card you provide today until you cancel. You can cancel anytime to avoid future charges by calling Customer Service at 1 (800) 470-7870. Consult your physician and follow all safety instructions before beginning this high-intensity and physically demanding exercise program and nutrition plan, or using any supplement or meal replacement product, especially if you are pregnant, breastfeeding, have any medical condition, or are taking any medication. Beachbody, LLC is the owner of the CORE DE FORCE, Shakeology, Portion Fix, Your Daily Dose of Dense Nutrition, P90X, INSANITY, 21 Day Fix EXTREME, TurboFire, Fixate, Beachbody, and Team Beachbody trademarks, and all related designs, trademarks, copyrights, and other intellectual property. It’s no secret—getting knockout results in 30 days takes work. And it’s easier to stay committed when things like low energy and soreness aren’t holding you back from achieving your goals. That’s why Joel and Jericho created the CORE DE FORCE Performance Pack. Not only will you get the mixed martial arts-inspired workout designed to slash inches off your waist, blast belly fat, and carve total-body definition, but you’ll also get the pre-workout energy to hit your workouts with everything you’ve got and the post-workout support your muscles need to come back stronger and ready for more. You can even start streaming your CORE DE FORCE workouts because your Performance Pack includes 30 days of FREE access to Beachbody® On Demand! You get two cutting-edge performance supplements with key ingredients to help boost your energy, sharpen your focus, improve your endurance, combat exercise-induced muscle soreness, and speed muscle recovery.‡Beachbody Performance helps you take advantage of every minute—before and after your workout—to help you get faster results from CORE DE FORCE. Pomegranate extract, a powerful extract shown to help promote faster muscle recovery, reduce exercise-induced muscle soreness, and improve muscle strength recovery. A Set of Portion-Control Containers to make your meal prep even easier. Stay focused on your goals with FREE support around the clock, as well as nutrition tips and personalized fitness advice from real pros who know how to make sure you succeed. *With Beachbody Performance on Home Direct, you’ll receive this item every 30 days, shipped directly to your door and billed to the credit card used today in the amount of $109.95 a month plus a Super Discount shipping and handling fee of only $2.00 per unit. You may cancel anytime to avoid future charges by contacting Customer Service at 1 (800) 427-3809. **After your first 30 days, you’ll be automatically billed to continue your Team Beachbody Club membership, including Beachbody On Demand streaming access, at a cost of $2.99 a week, billed $38.87 per quarter in advance to the credit card you provide today. You can cancel anytime to avoid future charges by calling Customer Service. If you choose not to take advantage of your FREE trial membership in the Team Beachbody Club, you may remove it from your Challenge Pack at checkout. This will not, however, change the price you pay today, and you will lose streaming access to CORE DE FORCE and thousands of dollars in additional workouts. Beachbody, LLC is the owner of the CORE DE FORCE, Beachbody Performance, Beachbody, and Team Beachbody trademarks, and all related designs, trademarks, copyrights, and other intellectual property.